Chase Freedom Credit Card Cashback Calendar: For Chase Freedom Credit Card holders, we’ve compiled a post where you can keep up with the 5% cashback categories each quarter. Be sure to log into your Chase account to activate each quarter’s 5% cashback categories! Chase Bank is available in the following states: AZ, CA, CO, CT, DC, FL, GA, ID, IL, IN, KY, LA, MA, MI, NJ, NV, NY, OH, OK, OR, PA, TX, UT, WA, WI, and WV. See below on more info regarding Chase Freedom Credit Card Cashback Calendar. Editor’s Note: Interested in banking with Chase? See our full list of Chase Bank Promotions! 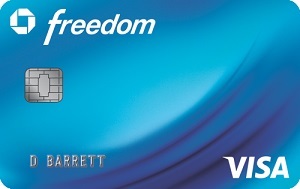 See our full review of the Chase Freedom Card! 4 Interested In A Checking & Savings Account? Activate each quarter to earn 5% cash back on up to $1,500 in combined purchases in this quarter’s bonus categories. Only purchases for internet, cable, satellite television, radio, cellular, wireless data, and landline services will qualify. Please note that purchases of equipment are not included. In addition, if you purchase or pay for your internet, cable and satellite television, phone or related services in a merchant’s store that is not classified by the merchant in the applicable services category, the purchase or payment will not qualify; for example, phone bill payments in a merchant’s store that is classified as a telephone equipment store. Does not include merchants that do not specialize in selling automotive gasoline; for example, truck stops, boat marinas, oil and propane distributors, and home heating companies. Includes purchases made using your Freedom card with your Chase Pay, Apple Pay, Samsung Pay, or Android Pay digital wallet during check out. Eligible purchases only qualify for a total of 5% Cash Back rewards; purchases made using eligible wallets at other current 5% quarterly categories will be awarded a total of 5% Cash Back rewards on up to $1500 in combined purchases. See the FAQs. During the 2nd quarter (April – June 2018), you can earn 5% cashback rewards in the following categories: Grocery Stores, Chase Pay, & PayPal on up to $1,500 in combined purchases when you activate. 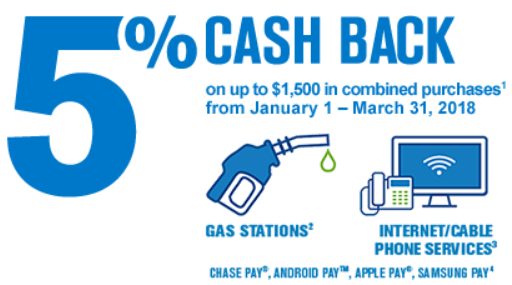 Be sure to log into your account to activate the cashback category offer! Activate each quarter to earn 5% cash back on up to $1,500 in combined purchases in this quarter’s bonus categories. You will still earn unlimited 1% cash back on these purchases. 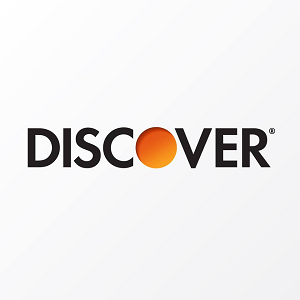 Does not include purchases made at Walmart® or Target®, discount, or warehouse club stores, except for purchases made with these merchants using Chase Pay or PayPal (a 5% category). If you do not use Chase Pay or PayPal you will still earn unlimited 1% cash back on these purchases. 3Includes transactions made using your Chase Freedom card with PayPal for purchases or sending money. Eligible transactions only qualify for a total of 5% Cash Back rewards. 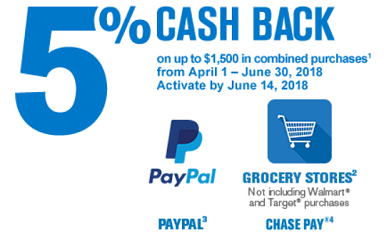 Purchases made using PayPal at other current 5% quarterly categories will be awarded a total of 5% Cash Back rewards on up to $1,500 in combined purchases. When you send money to Friends & Family via PayPal using your Chase Freedom card, standard transaction fees apply. See PayPal’s fees. Websites and other information provided by PayPal are not within Chase’s control and may not be available in Spanish. Must have/open a PayPal account to send and receive money. 4Includes purchases made using your Freedom card with your Chase Pay mobile wallet during checkout. Eligible purchases only qualify for a total of 5% Cash Back rewards. 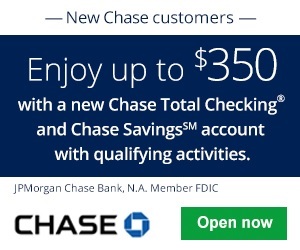 Purchases made using Chase Pay at other current 5% quarterly categories will be awarded a total of 5% Cash Back rewards on up to $1,500 in combined purchases. 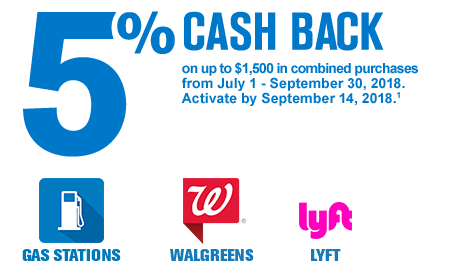 During the 3rd quarter (July – September 2018), you can earn 5% cashback rewards in the following categories: Gas stations, Walgreen’s, Lyft on up to $1,500 in combined purchases when you activate. Be sure to log into your account to activate the cashback category offer! Activate each quarter to earn 5% cash back on up to $1,500 in combined purchases in this quarter’s bonus categories. See the FAQs. During the 4th quarter (October – December 2018), you can earn 5% cashback rewards in the following categories: Wholesale Clubs, Department Stores, & Chase Pay on up to $1,500 in combined purchases when you activate. Purchases made using Chase Pay at other current 5% categories will earn a total of 5% cash back. Be sure to log into your account to activate the cashback category offer! Reach someone helpful. Call 1-800-935-9935! Interested In A Checking & Savings Account? If you need a source to keep up with the cashback quarters, hopefully this Chase Freedom Credit Card Cashback Calendar post helped you! Let us know if it did in the comment section below! If you’re running low on checks, see our review on how to get order a new checkbook from Chase? Let us know about your thoughts and experience with Chase Bank in the comment section below! If you’re interested in more info regarding Chase Bank offers, check out our full listing of Chase Bank Deals. Be sure to check back on BankDealGuy for more bank deals!